Evangeline Downs is known for having more horses per race than any other track in the country. The more horses in a race, the better the odds of winning and the larger the payouts. So come out to the Home of the Biggest Fields! 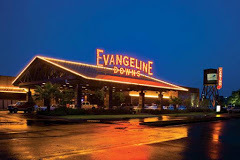 Evangeline Downs Racetrack & Casino is the first “Racino” built in this country from the ground up. We feature a state-of-the-art facility with a new one mile oval. The entire property consists of nearly 750 acres. The track houses nearly 1,000 stalls on the backside. There is a pond in the infield, but no alligators (that we know of). We now have a 7/8-mile turf track with a 1 1/8-mile chute. Evangeline Home Page with Event Info.